The popular television show “Unsolved Mysteries,” was a documentary-styled program pursuing answers to crimes and strange events that had yet to be solved and explained. As the saying goes, everyone loves a good mystery, as evidenced by the success of that show and the popularity of so many movies, books, and television programs about solving mysteries and crimes. The Trinity is also a mystery, but not the sort that needs to be solved, or can be solved. The popular apologist Frank J. Sheed (1897-1981), author of the classic work, Theology and Sanity (Ignatius Press), explained that a theological mystery is not a puzzle, nor is it “something that we can know nothing about: it is only something that the mind cannot wholly know.” The mystery of the Trinity is beyond our understanding precisely because God is so beyond man, who is limited and finite. Sheed used the analogy of an endless art gallery into which the visitor walks deeper and deeper—never reaching the end but finding the visit to be completely satisfying. 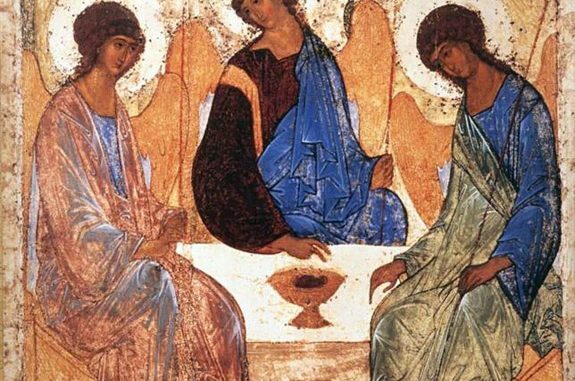 Sheed also describes “a Mystery” as “an invitation to the mind.” The Trinity, in fact, is an invitation, not only to the mind but to every hidden part and deep longing of man. Although the Trinity was not revealed until after the Incarnation, there are tiny hints in the Old Testament. Before God revealed himself as Father, Son, and Holy Spirit, he established that he is the one, holy, and personal Creator. The Israelites were surrounded by pagan tribes and groups believing in any number of gods. Many of those gods were bound to specific places and had only a capricious interest in the well-being of man. Moses asked the Israelites, in today’s reading from Deuteronomy, “Did a people ever hear the voice of God speaking from the midst of fire, as you did, and live? Or did any god venture to go and take a nation for himself from the midst of another nation …?” The one, true God spoke to Moses and the people, and he formed a covenantal people for the good of the world. The significance of these two actions cannot be overstated; they are essential acts that ultimately lead to God speaking to man through the Word—the second person of the Trinity—and establishing a people of God, the Church, through a new and everlasting covenant. 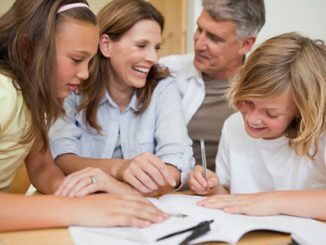 That covenant, rooted in the Father’s love, the Son’s sacrifice, and the power of the Holy Spirit, is intensely familial, relational, and loving. We have received, St. Paul told the Christians in Rome, “a Spirit of adoption,” by which we are made sons of God who are able to cry, “Abba, Father!” This gift of sonship is to be shared with the entire world. “Go, therefore,” Jesus told his apostles as he commissioned them to be his spokesmen, “and make disciples of all nations.” And how are disciples made? By being baptized in the name of the Father, and of the Son, and of the Holy Spirit, and by following the rules of the family of God, the Church. One of the most puzzling, even perverse, falsehoods of our age is the notion that the Christian belief in the Trinity somehow makes God too specific and exact, and that spiritual growth and enlightenment is best reached by speaking of God in vague and abstract ways. This is like saying that a child is harmed by personally knowing his two parents, and that he would better off believing any one of millions of adults just might be his father or mother. The fear of so many, at the heart of it, is that an encounter with the true and living God will change them; it will require a transformation in what they do and think—and in who they are. That, of course, is true. But accepting the invitation of the Trinitarian mystery is not about solving God, but recognizing that the answers to our deepest questions are found within that mystery.